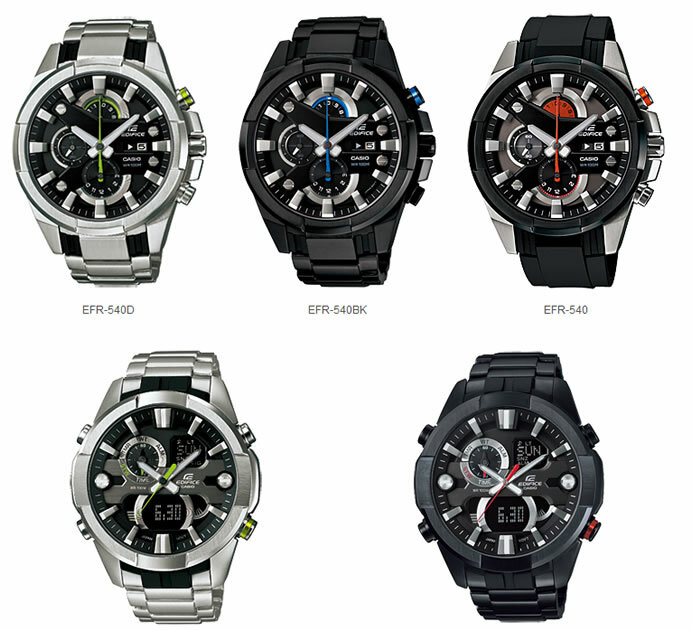 Casio announced today the release of the new EFR-540 and ERA-201 watches, the newest additions to the EDIFICE line of metal watches for men which capture the essence of Speed and Intelligence. The analog EFR-540 and digital/analog ERA-201 watches have a multidimensional and dynamic design highlighted by a layered face. Both watches have lustrous, sharp-looking hour indicators and impressive inset dials, giving them a feel of depth. The second hand is colored green, blue or orange as a design accent and for enhanced readability. The new Casio EDIFICE models feature a dual-layered, multidimensional watchface with expressive hour indicators and impressive inset dials. Casio is an official partner of the Infiniti Red Bull Racing Team—the current World Champions of Formula One. Responding to the requests of Team mechanics and engineers, the timekeeping module is encased in a highly vibration-resistant αGEL (αGEL is a registered trademark of Taica Corporation in Japan, the United States, and other countries) to deliver outstanding vibration resistance.